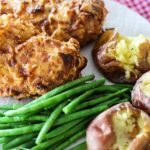 Smashed Potatoes and Buttermilk Fried Chicken is a favorite dish that gathers the family together for a down home meal to please all! What says comfort more than fried chicken? This dinner takes just a few minutes to cook after the chicken soaks in buttermilk. I usually place the chicken in the buttermilk early in the day (If the chicken is frozen, I just plop it in the buttermilk as-is. If you are a little skeptical about cooking fried chicken you’re going to love this recipe. It’s easy to put together and you can fry batches and then place the cooked chicken in the oven to keep warm. I put the potatoes in the oven about an hour before eating dinner. Then just steam the veggies while you’re saying a blessing. What could be easier than this? Ok, besides KFC. And the leftovers (if you have any)? You might be tempted to give up your firstborn for a piece of this cold leftover fried chicken. Wash and dry all potatoes, remove any eyes from potatoes with paring knife. Grease a 9x13 or jelly roll pan with cooking spray. Rub each potato with a bit of olive oil. Sprinkle with salt. Place pan in oven and bake potatoes for about 1 hour or until knife inserted in center of potato easily goes through potato. Remove and smash each potato with a fork. Sprinkle each potato with a little more salt and pepper. Drizzle with additional olive oil. If desired, spoon about a teaspoon of butter on each potato, top with Parmesan cheese, grated cheddar, chopped green onions if desired. Or just serve with olive oil and salt! Keep warm in 200 oven until ready to serve. In a 9x13 baking dish or gallon sized Ziplock bag, stir together the buttermilk and Tabasco. Remove chicken from buttermilk and let buttermilk drip off of chicken back into bag or pan. Place chicken in bowl of beaten eggs. Turn chicken and coat in beaten eggs. Place chicken in a bag with flour, salt, pepper and cayenne. In a skillet heat one half inch of oil over medium high heat. Test with a tiny bit of chicken. If it bubbles immediately, the oil is ready for frying. -I use about 2-3 small potatoes per person. -I use about a quarter to a half inch of oil in the bottom of the pan. -I use 4-5 boneless chicken breast halves. If the chicken is thick, I slice it in half lengthwise so it does not take too long to cook. -The chicken is delicious served cold as a leftover the next day! I love the stuff you do here! This is a great recipe to have, people, you really must try it, Si is spot on here! I really like my chicken in buttermilk, over night is best in my opinion, before frying it, soooo tasty!! Nice idea on the taters, will be making them next time I make chicken. Sunday dinner! Love the buttermilk. In fact, I wish this is what we were eating today.